I'm still on the track of the rascally Roadrunner..
the picnic table right out side of our coach??? With me on the losing end. The roadrunner checking my every move. I got this one lousy photo. move into or behind another bush or Cactus. I figured I'd flush them out and then catch them out in the open for a good shot. the little rats had disappeared into the desert. Up to the top of the hill I continue.. I'm still on the trail Kim. beyond, up Oak Creek Canyon towards Flagstaff. follows a stream flowing downhill. 7,000' into Sedona at around 4,500 feet. Due to the creek, it is a green oasis. Is this what you thought Arizona looked like? an open air bazaar where you can shop all sorts of interesting wares. Kate helped the local economy. who wants to make the pilgrimage to Mayberry some day. Heading back down the canyon you pass Slide Rock State Park. The park is a water lovers delight. passing by Kate got a picture of the bathers enjoying a cool slide. Further down the canyon, the red rocks of Sedona once again appear. And eventually you arrive in "Uptown" Sedona. 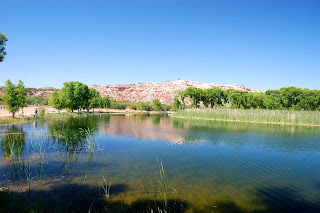 We took the doods for a long walk around some of the "lagoons"
natural ponds that are supplied by springs from the surrounding mountains. Water is life in the desert. The more there is.... the more there is. Tomorrow we will spend time back over in Prescott. Perhaps look at some real estate. What a great town. We definitely want to spend some time there in the future. I have an appointment at Ford for normal scheduled service, oil change etc. then Thursday we make the 3.5 hr drive north to Grand Canyon. a pandoras box of ancient indian curses. I'm starting to think that she did. be overnighted to me on Weds. Two days ago I noticed that a vent cover on the roof of the coach had blow off. Yesterday my Verizon internet device malfunctioned and blew out the Sim Chip. sim chip. They will overnight a replacement device on Weds. sim chip while I await the replacement to arrive. If things run in 3's then perhaps we are ok now. Yesterday we traveled over the big mountain to Prescott to pick up the simm card. Coming back from Prescott (pronounced Presskit) you travel AZ 89a over the mountains. 2,000' below. Sorry but we only had the little camera so the pix are not the best. trying to keep my wide rear axle on my side of the road. A mining town, Jerome was established on the side of Cleopatra Hill in 1883.
and financed mining there. Eugene Jerome never visited his namesake town. William Munds was the first mayor. which was to produce over 1 billion dollars in copper, gold and silver over the next 70 years. The 2006 census put it around 350.
to the desert where they would be unloaded and warned under threat of death not to return. a Mexican restaurant that had all of these painted cattle skulls. in to get this shot. Each one is painted by a different artist. They were really cool! Every time Kate leaves the truck, the Doods go on red alert until she returns. Here they are in the back seat looking for her. Yesterday I was sure that I took the camera..
two adults walked right in front of us. Where the heck is the camera???? Where the heck is my iPhone??? Get me a paper and pencil... I'll draw them!! By the time that we found a camera - they were gone into the bush. Fear not..... I'm still on the trail. what todays day off is really about. Many have died so that we may live free and debate the issues of the day. in Phoenix last night so that he could make is 0700 flight this morning back to JFK. That meant that between yesterday morning and last night we had some speed touring to do. at one of my favorite breakfast Bistros.... Ronaldos' Steak House (aka McDonalds). The Montezuma Castle National Monument. This area of the country is rich with Native American Heritage sites. There are tens of thousands of sites in Arizona alone. Verde River runs clear and cool... a perfect source for drinking and growing crops. This cliff dwelling was part of a complex that housed several hundred inhabitants. were used to sustain life, cure ailments, and used for tools. was built above the river flood plain. In this case on the top of a hill 120' above the river. preserving the moist river bottom for farming, easier defense. places that were created in this fashion. Thank you President Roosevelt and all those long gone workers! It's so important to preserve Americas great treasures for future generations. Once they are gone - they are gone forever! higher was your rank within the social structure. can see the edge of the valley. The valley is an oasis in the desert. the road for a trip North up the Valley to Sedona. Sedona is famous for its beautiful red rocks. didn't realize just how beautiful it is. We did some real fast speed touring thru Sedona, down to Oak Creek and back. While in Oak Creek we saw some smoke rising and increasing in intensity. blowing up to 60mph at times which as compounded the problem. We were concerned a wild fire had started and was going to burn this beautiful area. structure had burned to the ground. and will no doubt be back up to Sedona for more pictures. Western slope to the town of Jerome. Jerome is perched on the side of a mountain overlooking the Verde Valley way below. cattle skulls all over the wall. It was the most interesting artwork. arrived back here at 8pm. Kate left a trail of tears part way up Interstate 17. We both were sad to see Paul leave. much fun over the past week. It passed way to quickly. We just laughed and laughed for hours on end and now the RV is an emptier place without him. its simply the name of where we were and where we are. shards littering the grounds where the village once stood. Everywhere you looked you could find shards. Third and most importantly - it's REAL bad Karma! It was the most amazing thing to just find this stuff everywhere. What was their life like? How big was their family? It was interesting... We laughed our butts off! Cottonwood, Arizona and Dead Horse Ranch State Park. We are now there, on a mountain side overlooking the Verde Valley. Saturday morning flight back to NY. visited the Opus One Vineyard in Napa Valley. Tomorrow is another full day. We have several historic sites to visit before we head to the airport. Well today we finally said good bye to Show Low and hit the road. Our destination was a short 75 miles and was a bit of Deja vue. We are back at our campsite in Homolovi State Park just north of Winslow. We chose to make a big loop (see the on-line map on the blog and you'll understand). By staying again at Homolovi, we are able to park and make a day trip to Meteor Crater. decided to hit this part of the country at about 26,000 mph. The crater is about 1 mile across and about 700 feet deep. It could fit over 20 football fields at the bottom. If it was a stadium, it would seat over 2 million people. It was used by all the Apollo Astronauts for practice prior to the moon landings. Tomorrow we have a short 2 1/2hr drive to the Sedona, Az area. write and ask questions about how we do what we do. How do you blog from all the places you go? What's it like pulling that big 5th wheel? some - perhaps more would like to know. How do I work from the road? Working from the road is no different than working from a home office. You need certain things in both places for it to work effectively. First you need the type of job that allows it -If I was a school teacher - it would be pretty difficult. Third - I need a good internet connection. Forth, I need a way to stay in touch via phone. Fifth, I need the accessories (printer scanner etc). Finally - you need to have the discipline to remember the job has to come first... period. I have one and two covered. My internet connection is provided by a Verizon MIFI device. This little device is like a cell phone but wirelessly provides me high speed internet. It's about the size of a credit card, just a bit thicker. at the same time... no software required. I can drive down the road with it running and receive email on my laptop, iPad, cell phone etc. safely. I can print something out on a printer in NY from a campsite in Arizona with ease. My office phone rings on my cell phone so I am connected virtually 24/7... just like at home. I have a printer and scanner, both portable size, that give me the final piece of the puzzle. Last is the discipline. I guess I'm fortunate in that dept. I make sure that I work extra hard to deal with problems that arise IMMEDIATELY. With the freedom comes responsibility. where we are temporarily out of range of internet but now a days not often. My usual day starts about 5am local time. issues that might have come in over night. If we are traveling that day - I get 3hrs work done before we move. If not - more. on the computer to address something more detailed. If so - so be it. that I could not take care of during the day. see things so much clearer and from a different perspective. Blogging is my second job. once again you need a good internet connection. Then you need the discipline to do it after your work day is over. start sending me emails any day I miss a post. Its good to know that you enjoy the blog. That's what makes it fun for me. Good internet and a free account with Google Blogger is all it takes to start. and make them faster to upload.... remember I'm on a mobile connection. Other than that - it's easy. Again - it just takes the discipline to stick with it. That's why I have great respect for my other blogger buddies out there who also post. It's a lot of work posting and we love to hear back from our readers. OK... Lastly - pulling the 5'ver. Being an ex Over the Road Trucker helps, but is certainly not required. For me pulling this thing is second nature. You must be patient and not tailgate. You can't stop as fast as a car. Everyone is going to want to cut in front of you. Let them. Don't fight it. You'll lose. Keep leaving space for them to do so and not get upset about it. if you go to fast and use them too much. I go down hills at a speed that allows the engine to hold me back and not use the brakes. This saves them for emergency use. Watch out for low bridges. Don't try to drive thru the McDonalds drive-thru. Backing takes some practice but in no time you'll back into spaces like a pro. to drive like one or make the same time. Its not the destination.... it's the journey. For those of you still awake - thanks for reading. Maybe we'll see you out on the road! Todays Journey took us back in time and provided a feast of colors. and the Petrified Forest National Park lies within the Painted Desert. a humid tropical forest and was located about the latitude of present day Panama. The animals that roamed the land were the precursors to the dinosaurs that we all know. the waterlogged trees sank in the swampy estuary. Some of these prehistoric trees were over 200' tall! Over time, the trees were buried deep in the mud. each cell of the tree being replaced by minerals and the trees turned to stone. worked against the upheaval of the land. once again saw the light of day. in search of precious stones. You can look at this amazing relics of the past and see the bark & the tree rings. direction to the Petrified Forest. that give this desert a particularly colorful appearance. Our visit was during the height of the day. the colors would have been even more dramatic. 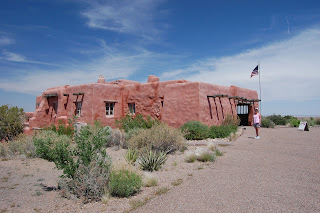 deep in the Painted Desert lies the Painted Desert Inn. The Inn was constructed 1937-1940 and was quite the place in its day. His murals all reflect life of the Native American People who called these lands home. it was also a sacred journey. The view outside the inn is breathtaking and changes with the light. Inside the inn, the colors reflect the beauty of the desert. was crossed by waves of post war travelers on on US Route 66.
road bed of that famous highway. of the communities through which the road passed. of being bypassed by the newInterstate Highway System. along the route is a reminder of those days gone by. which I stand and take the picture below. playing on the AM radio. as well as so many decades ago. now lost, but still alive in our hearts and our memory. Show Low... Where did the sun go? BEEP BEEP.... I'll get you Roadrunner! Ready or not.... Here we go again!